Access to literary materials that meet the rigorous standards of critical editions remains challenging for textual scholars who have print disabilities. Conversely, though, the many assistive technologies available to people with print disabilities prove particularly useful to those in the field of bibliography and textual criticism. The application of these assistive technologies to textual studies could open this discipline to all interested scholars regardless of their ability to examine a document visually, thus moving the field positively in the direction of universal design. This article considers the “General Prologue” to Geoffrey Chaucer’s The Canterbury Tales as a demonstration case for the application of assistive technologies to provide access to scholarly literary materials. More specifically, I propose combining the Text Encoding Initiative (TEI) tagging system with uncontracted Braille to provide full descriptive access to documents and all of their features, even if the scholar cannot visually read a word of text. Had the professor made the above statement in 1999 instead of 1989, he might have exposed himself and his institution to legal action, media scrutiny and all of the negative repercussions that issue therefrom for violating the Americans with Disabilities Act (ADA). An assistant professor at the time, his chances at tenure may well have been dashed. However, he may have stood in esteem and appreciation among his colleagues for defending the integrity of his field in particular and of scholarship in general. In this case, however, the ADA (United States, “Americans” n. pag.) still lay at least a year in the future, and, no matter, because his student actually agreed with him. That student was me. The print in my 1987 Riverside Chaucer—the scholarly edition edited by Larry D. Benson, based on the 1957 work of F. N. Robinson, (Benson, title page) that served as the text for the course—was far too small for me to read at adequate pace to keep up with my classmates and the progress of the course. Even with the magnification technology available at the time, which required cutting the textbook apart and putting the individual leaves under a light-and-camera apparatus that projected an enlarged image onto a screen (an early CCTV), my reading pace was simply too slow. Furthermore, due to the thin nature of the printed leaves, the text on the side of the leaf I was not reading showed through under the intense light and occluded the text I was trying to read. With no large print, audio or Braille transcription of Benson’s edition available, and no complete and accessible version of The Canterbury Tales available at all in Middle English at that time, I resorted to the only alternative at hand back then, a multi-cassette audiobook read from a modernized edition whose unremarkable bibliographic pedigree I no longer recall. It was at this mutually disappointing recording that my professor directed his comment. To explore and demonstrate the still largely unmet need for accessible yet rigorous scholarly literary materials, and to propose some best practices for creating them, I recently developed a very brief sample scholarly edition of the initial 42 lines of Geoffrey Chaucer’s “General Prologue” to The Canterbury Tales. The present essay demonstrates that the tools and techniques used to accommodate those with print disabilities can benefit other scholars as well. The working prototype contained all of the customary components of scholarly editions, including transcription of a copy-text, a note on the text, a stemma relating collated witnesses to the selected copy-text, textual notes that collated two additional print and one Braille witness to the copy-text, an explanation of the treatment of line-end hyphenation, and annotative notes (Modern Language Association Committee on Scholarly Editions, n. pag.). In textual scholarship, a “witness” is a singe document (copy) containing a specific version (edition) of a text to be analyzed and compared against other copies of the same version. I chose to take the copy-text for my sample edition (the main document against which other witnesses are compared) from F. N. Robinson’s 1957 edition of The Works of Geoffrey Chaucer (Rb) because of evidence within or relating to the other three witnesses, and particularly the Braille witness (Wn, Be, Br, United States, “Library” n. pag. ), that they were all based on or transcribed from Robinson’s work. One of the primary aims in preparing the sample edition was to investigate the reliability of a Braille witness against its copy-text from the corresponding scholarly edition. I selected the material for the sample case because I have observed that, even when The Canterbury Tales is taught in high school, teachers often present facsimiles and transcriptions of the “General Prologue” in Middle English to introduce students not only to the linguistic differences between the English of Chaucer’s time and that we speak today, but also to acquaint them with book history and the medieval manuscript tradition. Even for the high school student, large print, audio recordings and some forms of Braille do not adequately transmit the text itself, let alone the bibliographic materiality of that text, such as the layout and placement of line breaks. In the typical secondary and undergraduate classroom, however, a general edition, the trade paperback edition, or the audiobook read therefrom, is too often substituted to accommodate students with print disabilities in many situations, such as when only the basic content is the focus of learning, when students are expected only to know the characters, plot and central theme of a work. For the more advanced student at the upper level, post-secondary level and beyond, however, that materiality becomes an essential dimension to understanding the reception of an author’s work in context and its eventual transmission. Despite advances in public policy and technology, accessible scholarly materials remain rare, and obtaining them remains challenging. The ADA and advances in technology have improved access to literary materials, at least in the United States, but not necessarily to scholarly literary materials, or to primary source materials, either in the United States or elsewhere. For example, Chaucer’s work is now available in Middle English in Braille (United States, “Library” n. pag. ), but it is in a contracted type of Braille that does not preserve material elements of form that are of interest to textual scholars, which I shall explain in more detail below. Moreover, it took three weeks to locate and acquire the single Braille witness in Middle English of Chaucer’s “General Prologue” to The Canterbury Tales that is the subject of the present work. My institution’s Student Disability Services was not able to locate the copy, though they tried. My state’s Department of Assistive and Rehabilitative Services, Division for Blind Services was not able to help either, though they tried. The state-level accessible library materials division, commonly known as the “Talking Book” program, identified the catalog entry, but did not have access to the actual physical book. Finally, I made contact with an archivist at the Library of Congress who was able to locate and retrieve the witness and have it mailed it to me. And when the Braille copy finally arrived, I discovered that its catalog entry contained a serious error (United States, “Library” n. pag.). The witness is actually transcribed not in uncontracted Braille as per the catalog entry (United States, “Library” n. pag. ), but in contracted Braille, the type that does not do a good job of transmitting a document’s material form. Thus, a truly fully accessible, universally designed scholarly edition of Chaucer’s works remains available as the life work of a future textual editor. After establishing some parameters for accessibility, scholarship, and universal design as they pertain to this work, the present essay discusses in detail potential alternative approaches for accessing text and producing a scholarly apparatus, identifying advantages and disadvantages of the device or technique involved in each approach. In the interest of advancing the field of textual scholarship toward universal design, I also detail the advantages of many alternative techniques and assistive technologies to scholars without disabilities. Indeed, many of the approaches and devices designed to assist people who have low vision can be of very applicable use to all textual scholars and other close readers of literary works. In essence, I explain ways to “reverse engineer” print-disability-related techniques and technologies to promote accessibility across the field of literary scholarship. Ultimately, for accessible literary materials to rise to the standards of scholarship, making them available in TEI-encoded (Text Encoding Initiative) uncontracted Braille stands out as a viable best practice. This section defines the importance of scholarship, emphasizes the need for access to scholarship, and forecasts the goal of universal design in textual studies for the benefit of those readers who may be unfamiliar with this field or with disability studies as a discipline. The Modern Language Association’s (MLA) Committee on Scholarly Editions (CSE) is the standard-bearer for textual scholarship in English. According to the CSE, for a literary edition to be lauded with the mantle of scholarship, or to be given the designation “Approved Edition,” it must put forth a “reliable text” (n. pag.) that meets the highest standards of “accuracy, adequacy, appropriateness, consistency, and explicitness” (n. pag.). An edition that meets these criteria must have extensive supporting apparatus, such as textual notes and annotations, which must also be accessible to both editor and readers. Accessibility, to a textual scholar, means bringing together the right set of texts and tools (and workarounds if needed) to be able to analyze and evaluate written, printed, or digital scholarship, and then to produce additional scholarship to standard. Before any textual scholarship can begin, scholars must have access to copy-texts that either already exist in or can be converted to alternative formats. They must then be enabled to transcribe accurately and to validate that transcription with at least three rounds of proofreading (Modern Language Association Committee on Scholarly Editions n. pag.). Based on experience, I recommend at least two additional rounds, followed by a check by a trusted beta-reader, for scholars who cannot quite trust their eyes. Collation, the careful comparison of a witness against the copy-text to identify variants, presents possibly the greatest challenge to any textual scholar with a print disability. At this stage, a tactile approach such as Braille can be very helpful, as well as audio collation. Finally, the rigorous textual scholar must be able to access and read secondary scholarship, and perhaps related primary sources, to annotate the work thoroughly and accurately. Textual scholars with print disabilities must insist upon, participate in, and help develop adaptive approaches that enable their editions to achieve the highest possible standards of quality so that their work is not dismissed out of hand as having been impossible due to the scholar’s disability. Universal design seeks to create an environment through which as many otherwise qualified users as possible can engage with the subject matter it encompasses. A universally designed environment does not need additional retrofits to be usable (Hamraie n. pag.). Rather, the accommodating features that remove access barriers are built in. Here, the universally designed environment is a scholarly text. To borrow terminology from the Americans with Disabilities Act, by “otherwise qualified users,” I mean that, in the context of textual scholarship, a user needs to be a the very least a student with appropriate literacy skills (including basic Braille literacy), and at best a textual scholar knowledgeable of the foundational terminology and conventions of the field. The broader application of disability-related technology moves the discipline of textual studies toward the universal design of scholarly texts. Making textual scholars more aware of the available tools and techniques, and incorporating them into the training of the next generation of textual scholars, will promote the field as a barrier-free option of study for all interested students. If everyone uses these tools, they are no longer exclusive to people with disabilities. In the broadest, most philosophical sense, then, a universally designed environment is inclusive. While it may seem sensible on the surface that those members of the academy who have the most knowledge of literary materials might be able to suggest the best ways to access them, the above directive from the MLA does not explicitly address the need for technical knowledge of alternative formats and assistive technology to know which accommodations to make available. A better approach might be to task departments and institutions to accomplish the above directive by engaging in thorough audience analysis to identify the needs and expectations of all who will use the published documents. Dialogue with a variety of potential users will prove helpful here, as would usability testing of beta materials. When focusing on proactive accommodations as a step toward achieving universal design, a key point to understanding and providing meaningful access is that there are as many definitions of it as there are people with access needs. Just as everyone’s writing process is a bit different, the access protocols, the “what works,” if you will, is also a bit different for each person who needs to overcome an access barrier. For example, consider two users with low vision. One may have enough residual vision to read standard print with digital magnification. The other may need Braille. It depends on the type and severity of vision loss and on the types of documents to be accessed. Here, consider the hypothetical case of a delicate, rare document from the fourteenth century. Most digital magnifiers use very bright light to help capture the images to be enlarged. Scholars know that they cannot expose such documents to intense light without damaging them. The academy thus needs to develop an alternative means of access to protect both the user’s rights and the documents. In addition, when we think of accessibility in relation to written, printed, and digitized literary materials, we usually think of accommodating for the visual impairments of students and scholars whose conditions, which are due to some pathology of the visual system, qualify as disabilities under the ADA (United States, “Americans” n. pag.). However, many of the technologies and approaches used to accommodate those whose eye conditions are severe enough to qualify as disabilities can also be of great benefit to sighted, close-reading members of the literary community, and particularly to textual scholars, when their eyes tire, or when, often just as they reach the peak of the profession, their vision begins to deteriorate due to age. Dyslexic scholars may benefit from Braille because it would allow them to bypass the cognitive disconnect between eyes and brain to access text tactilely. Furthermore, we must consider that not all print disabilities are due to blindness or low vision. Dyslexia, while not technically a disability under the ADA (United States, “Americans” n. pag.) can still disrupt a reader’s experience of a text through the perceived rearrangement of printed characters on a page or screen. For a textual scholar with dyslexia, creating a reliable transcription of a printed copy-text that meets the standards of scholarship (less than one percent error after three rounds of proofreading) (Modern Language Association Committee on Scholarly Editions n. pag. ), would be just as out of reach without accessibility or universal design as it would for a scholar who is totally blind. Because access to textual scholarship is a primary focus of this project, I will now take up a more detailed examination, using the example from Chaucer, of what standards of scholarship must be met, focusing on those criteria that present challenges and opportunities for advances in accessibility. 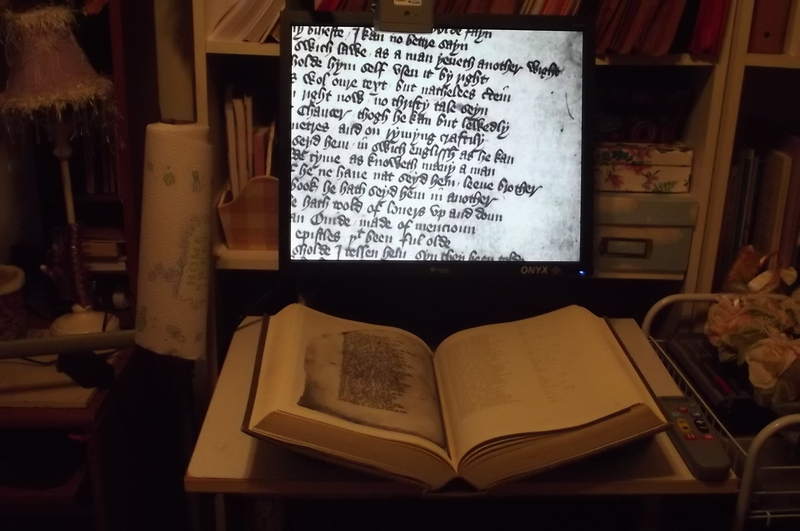 The following sections of this essay describe and evaluate the application of accessibility techniques and assistive technology during the production of my demonstration case for this project, a sample scholarly edition of the “General Prologue” to Chaucer’s The Canterbury Tales. The following descriptions, and all but one of the images, come from my own first-hand experience and original unpublished research. Hardware and software tools and techniques, both high-tech and low-tech, now exist to make text accessible. The spectrum of approaches includes simply having text read aloud on the low-tech end to using specialized magnification equipment and accompanying software on the high-tech end. Some more direct approaches are quite workable when textual materiality is not a concern. When it is, modern technology now offers that access, even to a textual scholar who cannot see at all. Even though all of the approaches described in this section are geared toward accommodating scholars who have print disabilities, those whose eyesight has diminished over decades of dedicated close research might also find them useful. For scholars with low vision who have some usable residual sight, large print is by far the first mode of access to handwritten and printed materials. Commercially produced books in large type have been available for decades, but the selection is limited mostly to popular fiction. In the absence of a large-print edition of a needed document, enlarging text from standard print is relatively easy to do by two readily available means. The first approach involves simply making an enlarged photocopy of the required text on a photocopier equipped with this feature. To preserve page layout of originals up to approximate quarto size of 8.5 by 11 inches, make the large print copy on 11 by 17 inch paper at 129 percent enlargement. Alternately, text can be enlarged in blocks at up to 400 percent enlargement on standard letter-sized copy paper, but this process does not preserve layout well without piecing and taping the individual sheets into large and unwieldy poster-sized leaves. The second approach to producing large-print versions of handwritten or printed material involves digitizing the original by scanning, keying, or, most recently, capturing to a device with enlargement capabilities. Once the text is digitized, it can then be viewed onscreen or printed in large type. These approaches can, with careful attention, preserve textual elements, which can then be explored using screen magnification or, in some instances, a screen reader. In the latest screen capture technique, I took a picture of a page of the edition from which my copy-text for my sample edition comes (Rb) with my 12.2-inch tablet, which has one of the largest screens on the market (Figure 1a). After I captured the image using my device’s camera, I used the pinch/stretch feature to enlarge it until I could read it comfortably. Furthermore, my particular tablet allows me to write on images with a stylus and save the annotated copy as a new image. In addition to leaving wonderful electronic marginalia “bread crumbs” for future textual scholars to enjoy, this technique allows me to gather my thoughts about and make notes on my research within the enlarged accessible mode (Figure 1b). What started as an adaptive technique to accommodate my own low vision could prove useful to my sighted colleagues as well in that it eliminates the need to make paper copies during library research, allows for more comfortable reading, and, for collaborative projects such as those in the digital humanities, facilitates research through instant image sharing. Additionally, processing the images through an OCR app can identify the text, and, in some cases, even read it aloud. However, such apps are fraught with the same problems of poor accuracy as computer-based OCR programs. To benefit those who require a bit more text augmentation and perhaps scalability, electronic enlargement of text can be accomplished via non-computerized and computerized methods using specially developed assistive technology. However, it is important to stop and remember here that high-tech is not always the best approach for all users in all cases. In some instances, a magnifying glass or simple pair of reading glasses will do. I have six different pairs of various strengths for brief tasks. For longer close reading, however, I resort to the more robust equipment described below. Electronic magnifiers come in hand-held and desktop models. The desktops appeared in the early 1980s, whereas the handhelds have been developed since the advent of the digital camera around the turn of the millennium. Both types of devices use cameras to capture images that are then enlarged onto viewing screens. Older models (Figure 2a) use intense light to illuminate and help capture the image. As noted earlier, rare books cannot go near these machines because of the intensity of the illumination. Newer technology, however, uses a free-arm camera that captures images with ambient light (Figure 2b). Figure 2a: A traditional desktop electronic magnifier uses light to capture images. A camera apparatus enlarges the images and projects them onto a screen. The book or document must also be in contact with the machine and lie relatively flat. Both conditions risk damaging the book, and are thus abjured by curators. Figure 2b: A free-arm electronic magnifier captures images using ambient light. The book or document can rest on the curatorial apparatus of choice. Accessibility is accomplished without any damaging bright light or equipment touching the document. Camera is top center. Additionally, these devices, with their adjustable swing-arm cameras and ability to focus even at oblique angles, accommodate larger books that must be supported on foam stands to protect their bindings. A pedagogical advantage of this type of electronic magnifier is its ability to interface with classroom-based audiovisual equipment, including projection to large overhead viewing screens. Instructors and presenters who have visual impairments can now give smooth presentations apace with their sighted colleagues, following along on their own enlarged screens. This approach also works well for those who need to show an object, but who simply have difficulty “explaining over their shoulders,” or who are uncomfortable turning their backs while presenting. The ultimate advantage of this equipment is its ability to project not only printed materials, but also objects and even live demonstrations. Under the camera, the teacher of book history can, for example, show the structure of a rare binding in great detail, enlarging and reducing the projection as needed. This can reduce unnecessary handling of delicate exemplars by eliminating the need to pass them around a large classroom or conference auditorium. I have also used this equipment in this way to demonstrate how to properly cut and shape a quill so that my audience did not have to crowd around a small work area and crane their necks to see. 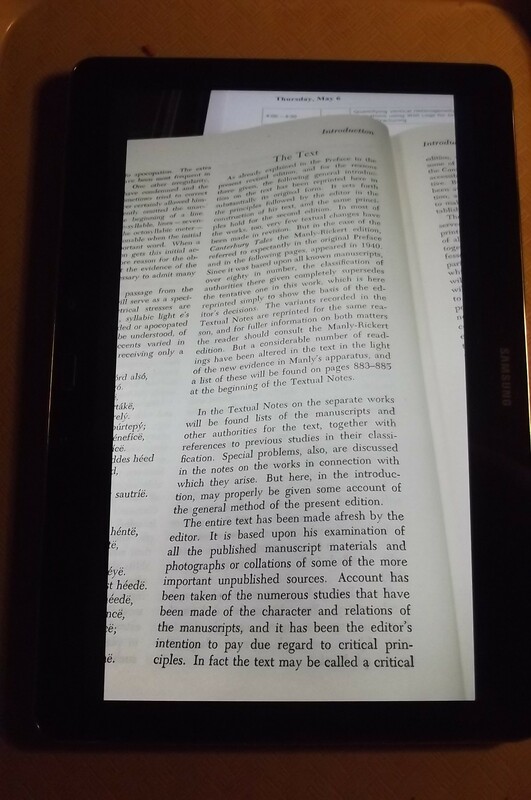 When large machines are impractical and reading glasses are inadequate, hand-held digital magnifiers can serve textual scholars as intermediaries (Figure 3). These small, portable devices are quite powerful, and on some models their lights can be deactivated. Their primary advantage to textual scholars is that they provide researchers access to library materials that do not circulate, as is the case with many archival primary source materials, yet they do not have to touch the materials to achieve access. The magnification capabilities of these devices are powerful enough that sighted scholars can use them to examine, and on some models capture still images, of very minute aspects of a non-circulating text, such as a detailed printer’s emblem on a title page. Granted, there are telephone apps that work in a similar manner, but the clarity and magnification is not yet as good as that of a handheld digital magnifier designed for people who are visually impaired. 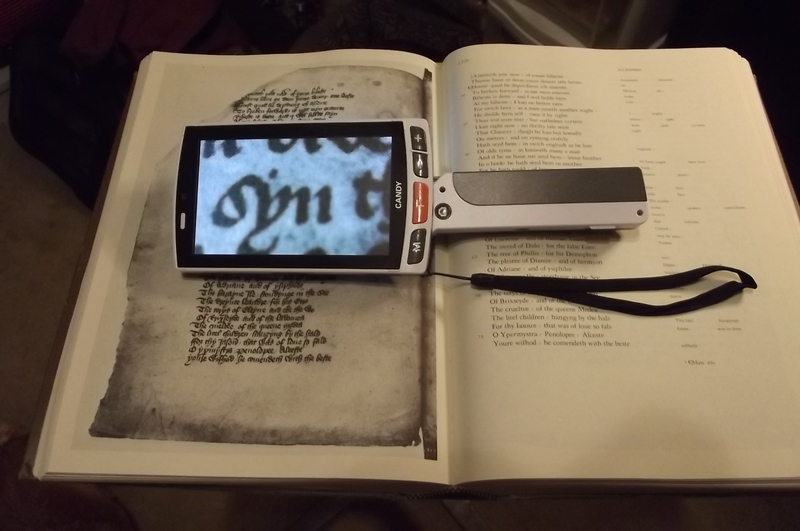 Figure 3: Handheld digital magnifier used to access a manuscript facsimile. Another textual studies magnification hack involves pairing a small light table with a desktop electronic magnifier (Figure 4). This combination can allow textual scholars who have some or all of their functional vision to almost quite literally see through paper. 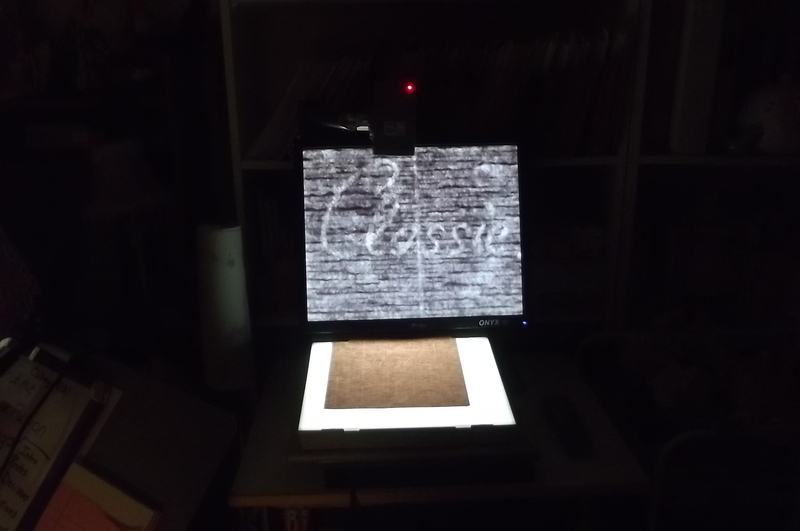 Figure 4: Light table paired with free-arm electronic magnifier to see through paper. Fibers within paper that can help date a document or identify its place of origin stand out, and undiscernible watermarks come clear. I once delighted one of my paleography professors by enabling the identification of a problematic watermark using my low vision equipment in this way. Electronic magnifiers paired with light tables, as shown above, can also help textual scholars who have low vision perform collation, with a caveat. For this process to work, the two texts to be compared must be printed with identical font, size and layout. Needless to say, this process only works if the reliability of both texts has been validated with the appropriate number of proofing iterations. It essentially involves multiple transcriptions, not only of the original or copy-text, but also of the witness to be collated. This process is quite useful, however, in comparing two versions of the same document, such as a typed letter, to identify emendations. Scholars who have low vision can also access digitized text via computer screen enlargement. The level of sophistication of the technology depends on the level of usable remaining vision. For those with relatively good residual vision, such as people with a visual acuity near the borderline for statutory blindness in the United States, simply reducing the computer’s screen resolution may help. On computers running the Windows operating system, holding down the CTRL key while scrolling the mouse wheel may provide the next best degree of scalable magnification in some applications. Beyond that, specialized magnification software, such as Windows Magnifier, now standard on Windows 7 and above, provides greater incremental screen enlargement with a few keystrokes. These light-duty, built-in screen magnifiers work well for performing brief tasks with low vision, such as checking a reference, or for sighted scholars whose eyes have grown tired. A quick click of the X returns the user to the original layout and presentation of the text. The most sophisticated screen magnifiers are those developed specifically for people with low vision. These applications provide intense enlargement, as well as other features to help make text more readable, such as different settings for background and font colors. These environments, however, distort the materiality of the text and thus distance the reader from it. Of course, the primary disadvantage of electronic magnification is that it still does not provide textual accessibility to those who do not have enough residual vision to use them, or to those with cognitive print disabilities where the enlarged image on the screen would be just as distorted. Those scholars may find the audio and tactile alternatives discussed in the following subsections helpful. Audio recordings, by their nature, fall short of the standards of textual scholarship because they do not preserve the materiality, and often fail to include the entirety, of the text. By this I mean that audiobooks, even those produced specifically for college students who have print disabilities, often omit critical elements of content or apparatus, such as textual notes and annotations. They are usually read from standard editions of works at best, and flawed ones at worst. Because of the sheer length of most scholarly editions, and the time it would take to read them aloud into a recording, rendering them in audio is problematic. 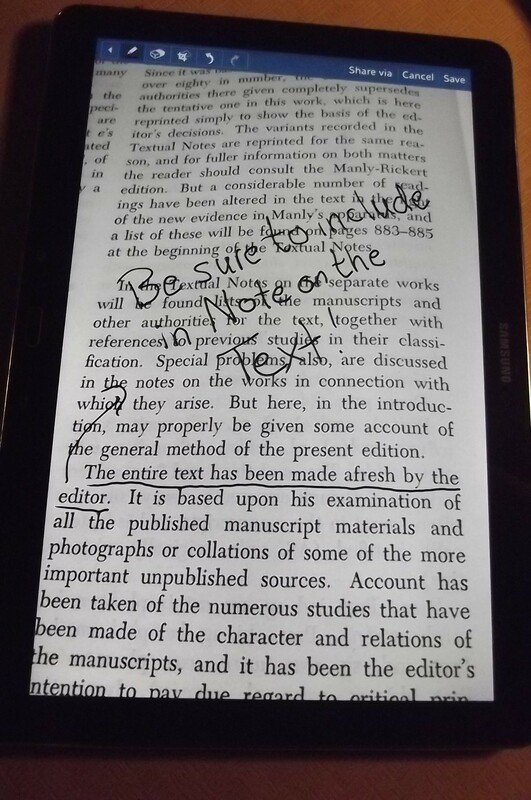 While some services will do this, the readers are not trained to describe material features of the edition being read that might be of interest to textual scholars. Traditional audiobooks can, however, be useful in the general sense of becoming familiar with a previously unexplored text or the style of an author one has never read before. A quick listen during a commute or plane trip, for example, might give a textual scholar a point of orientation and some ideas of what to expect from the more rigorous material to come. However, if a researcher can obtain an electronic version of a text that both meets the standards of scholarship and contains the requisite formatting to make it screen readable, computerized screen readers can be very helpful in that they will read that text aloud. A primary drawback to this approach is that too often electronic texts are not universally designed and are not screen readable (Oswal n. pag.). The more sophisticated programs, however, allow the user to choose a level of reading granularity from continuous reading all the way down to character by character; the latter feature is of particular use to the textual editor. Scholars who find collating problematic because they have difficulty managing two images visually can also make great use of this feature by listening, again, character by character, to one witness while following along with another by eye, under an electronic magnifier or in Braille. Sighted scholars who do not have access to low-vision technology can take advantage of this technique by first reading, once again, character by character, their copy-text into a recording and then following the playback with the witness being collated, marking variants as they become evident. In the case of primary works, reputably curated digital humanities archives, such as the William Blake Archive and Jerome McGann’s Rosetti Archive, may be another source of reliable electronic texts. Large digital corpora, such as broad, uncategorized collections of novels compiled for long-term storage or data-mining, are not good sources because they are too often populated via unreliable OCR scanning techniques. A live reader, particularly from one’s own discipline, such as a student’s classmate or a faculty member’s graduate assistant, can be a very valuable asset to a textual scholar with a print disability. These readers will understand the fundamentals and structure of what they are reading. The listener can stop the reader, ask for cross-reference (“look that up in the annotative notes, please”), ask that a page number be taken note of, etc. However, paid readers can be very expensive, especially when they are not fellow students or researchers on the same project who have to read the same material anyway. In the case of generalist readers unfamiliar with the listener’s work, their services, even with the best of intentions, can be as problematic as a non-scholarly audiobook. The same problem occurs with image description services. For example, the textual scholar’s fleuron (printer’s emblem) beneath a colophon (information about the printer and/or publisher) becomes the generalist’s flower on the bottom of the title page. In dealing with works that have linguistic characteristics that vary from the norm, a generalist reader may be totally lost, and his or her own accent, if one is present, can further complicate textual transmission. After all, in the case of Chaucer, even some scholars of Middle English find reading it aloud difficult. Throughout this essay, I have criticized the shortcomings of using audio versions of texts in scholarly work, even when read live from reputable editions, because they do not preserve and transmit textual materiality. A textual scholar cannot discern, for example, spelling, hyphenation, line breaks, punctuation, paragraph/stanza breaks, broken characters, differences in typeface, changes in type size, irregular spacing, or any other materiality from audio. Large print and magnified text can, if done correctly, transmit textual materiality, but even this is useless to the scholar who has very little or no functional vision. Yet, there remains a solution that can preserve and transmit a text, its materiality, and the human experience of interacting physically with a document to those who are not able to read it with their eyes. Braille is a coding system of patterns of raised dots arranged in clusters of six, called cells, which represent letters, words, parts of words and even some short phrases. This tactile writing system allows people who are blind or who have low vision to read text with their fingertips. Figures 5a and 5b below show the Braille cell and the Braille alphabet in English. Figure 5a: The structure of the Braille cell. Note that the dots are numbered to help users learn the various letter forms, word signs, and punctuation marks. 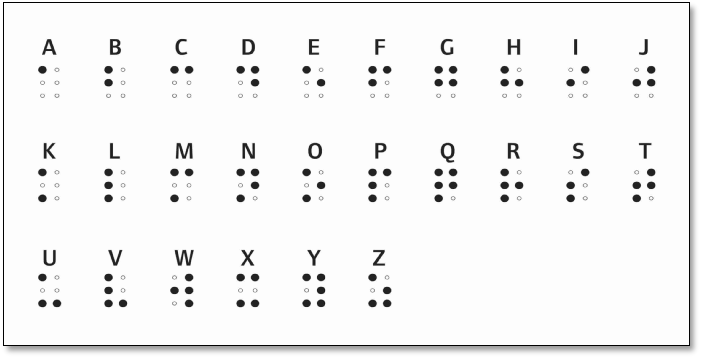 Figure 5b: The Braille alphabet in English. Uncontracted Braille uses a different symbol for each letter of an alphabet and for common punctuation marks in a given language. In scholarly textual terms, it is diplomatic in its approach to transcription, meaning that each and every character is transcribed as it appears in the original or copy-text. Contracted Braille, today known as Unified English Braille (UEB), by contrast, applies a form of shorthand abbreviations using the single-cell alphanumeric characters and a few two-cell and three-cell combinations to stand for parts of words, entire words, and a few phrases. 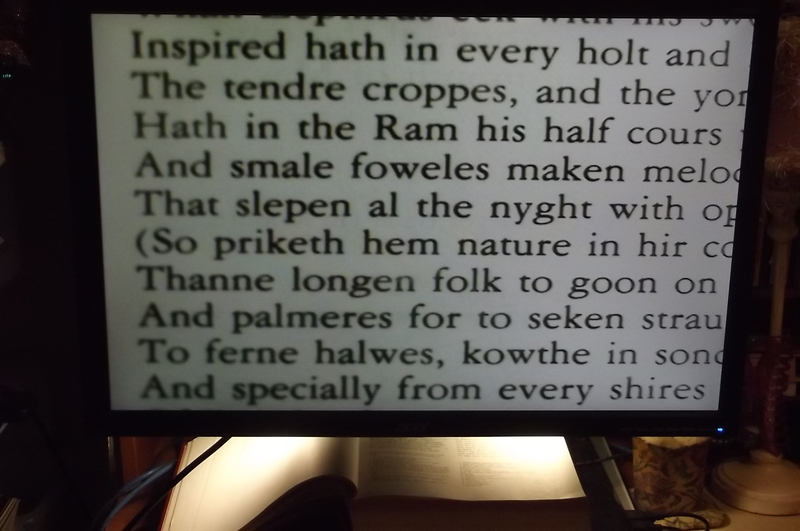 While contracted Braille may be more efficient, the contractions cause confusion in literary and textual scholarship where contracted word forms appear, such as those used in expressing dialect in dialogue, something Chaucer is known for doing well. Hence, rigorous textual scholarship will need to highlight these features. Scribal emendations and marginal notes, also often truncated and/or abbreviated, are other instances where their contracted forms can conflict with the notation conventions of contracted Braille. To review, in preparing this edition, I collated three witnesses of the first 42 lines of Chaucer’s “General Prologue” to The Canterbury Tales, including one Braille witness, against copy-text from F. N. Robinson’s 1957 edition of The Works of Geoffrey Chaucer (Rb). All witnesses, including the Braille one, claim derivation from Rb (Wn, Be, Br, United States, “Library” n. pag). My specific aim here was to evaluate the quality and reliability of the Braille witness as an exemplar of accessible scholarly literary material as part of my larger argument on accessibility and scholarship. As expected, the most variants occurred with the hand-transcribed Braille witness; however, these are largely transcriptive variants undertaken by the Braille transcriber (unknown individual) (United States, “Library” n. pag.) due to the rules of transcribing contracted Braille (American Printing House for the Blind n. pag.). According to the technical conventions of scholarly editing, these variants are not errors (accidentals), and they do not alter the meaning of the text (substantives) (Greg 21). I collate them because they do alter the presentation of the materiality of the text, which is an important matter of substance to textual scholars. Because of the size of the transcribed Braille symbols (correlating to approximately 18-20 point typeface size in print), Braille documents are very bulky. A complete King James Braille bible, for example, comes in 16 large binders and requires six linear feet of shelf space, even when printed in contracted Braille on both sides of the paper (interpoint Braille) (Braille Bibles International). Although uncontracted Braille reproduces each and every character from the printed page, including spaces, exactly, it does not preserve line length or line breaks because only about 28-35 characters and spaces can fit on one line of standard Braille, depending on the size of paper used for the transcription. The contracted form of Braille is coded by using a single symbol or small group of symbols to represent commonly used longer words and parts of words, such as “-ing,” “-tion” and “-er-.” For example, in contracted Braille, the letter “k” on its own (⠅ in contracted Braille) stands in place of the word “knowledge” (⠅⠝⠕⠺⠇⠑⠙⠛⠑ in uncontracted Braille) (American Printing House for the Blind 1). The contracted method helps save space and increase reading speed. The Braille Authority of North America defines these short forms and other notation conventions of contracted Braille. To add even more confusion to this mix, traditional contracted Braille notation is currently being retooled to conform to the new Unified English Braille standards. While experienced users of contracted Braille might transition easily to the new system, the changes in notation will further compound difficulties in the textual study of existing documents in traditionally contracted Braille. The following example illustrates the confusing conflict between contracted Braille and textual/scribal notation. In contracted Braille, it is customary to omit the space between some of the more common prepositions and the words that follow them (Duxbury Systems, Inc. 1). For example, in Line 2 of the printed “General Prologue” from Rb which reads, “The droghte of March hath perced to the roote,” the words “to the” in print become “tothe” in the contracted Braille witness, with the symbol for the word “to” and that for the word “the” adjacent to each other with no space (⠖⠵ in contracted Braille). While this convention does not result in substantive variants or errors per se, it does create variants of form. These can be problematic when the Braille reader does not know and cannot tell whether the original copy-text retained the space or not. This convention of abbreviating and condensing in contracted Braille can be especially problematic to the editor tasked with production of an accessible edition, as well as the scholar reading it, when abbreviations appear in the copy-text itself, be it printed or handwritten. Scribes in the manuscript era often made abbreviations of common words for the same space-saving reasons that Braille transcribers do today. For example, an examination of Line 1 of the “General Prologue,” “Whan that Aprill with his shoures soote,” in the facsimile edition of the Hengwrt Manuscript reveals a scribal abbreviation of the word “with” as “wt” (Ruggiers 3). In the present edition’s printed copy-text from Rb, “with” is spelled out, having been normalized by editor F. N. Robinson and clarified as such in his note on the text (xxxix). A Braille transcriber of the original Hg or a facsimile working in contracted Braille, however, would still use the abbreviation for the word “with,” which is represented as “⠾” in contracted Braille, even for the scribal abbreviation. Granted, the conscientious, or scholarly, transcriber could make a footnote explaining this emendation. In uncontracted Braille, however, with its strictly diplomatic approach to transcription, the original form of the scribal abbreviation (⠺⠰⠞ in uncontracted Braille, with the center symbol composed of dots 5 and 6 indicating that the next character is a superscript, a form marker in either version of Braille) is clear, as is the whole word spelled out (⠺⠊⠞⠓ in uncontracted Braille). Textual scholars can also use Braille to collate witnesses by printing both documents in Braille and then reading “two-handed;” that is, the left forefinger follows the copy-text and the right forefinger follows the witness. This approach is the tactile equivalent of using a mechanical collator, a device that uses mirrors to help editors spot textual variants by eye, in that the brain alerts when it perceives different symbols. From this discussion, we can take one step in favor of uncontracted Braille as a means of access for textual scholars who have print disabilities. Before identifying it definitively as a best practice, however, we must consider electronic Braille output. Today, tactile digital access to Braille comes in the form of a device called a refreshable Braille display (Figure 6). This device plugs into a computer or mobile device via a USB port. Proprietary software then “reads” text from the computer’s video output and transfers it to the refreshable Braille display one line at a time. Pins move up and down in the display to create the raised dot patterns of the Braille code (American Foundation for the Blind n. pag.). 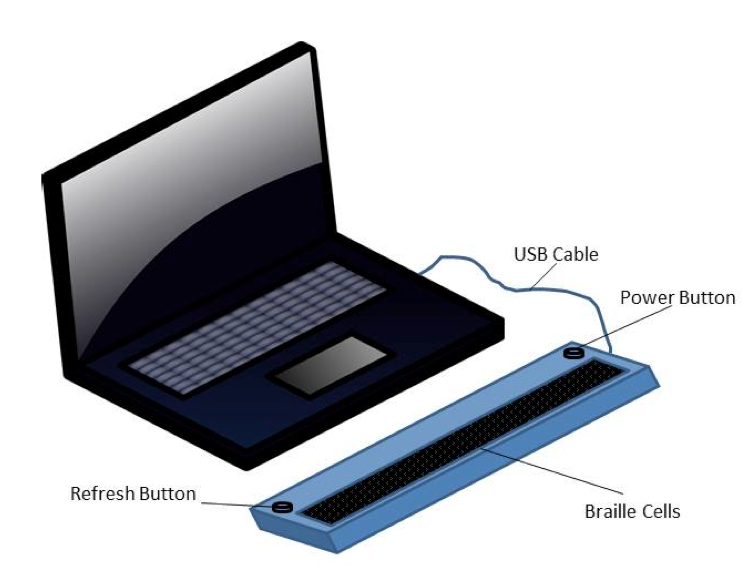 While providing Braille access to digital media, these devices are both complicated and costly. They are delicate, break down easily, and cost a great deal of time and money to repair. Still, they can provide quick access to electronic materials encoded in a way these displays can read. Such encoding is known as a .BRF file, or Braille Readable File (American Foundation for the Blind n. pag.). Figure 6: Refreshable Braille Display. These files, however, are almost always coded for contracted Braille and are not portable to a standard Braille computer printer. However, these devices can still prove useful to blind textual scholars whenever they can be set to display uncontracted Braille, and files so coded are available for use with RBDs. The primary limitation of uncontracted Braille of any output in the context of textual scholarship is that it does not on its own capture textual features of print such as broken characters, color, or images. However, with a little help from another tagging system, this limitation can be overcome as well. Today, literary texts that meet the MLA standards of scholarship can be made fully accessible to scholars with print disabilities, even if they cannot read a single line of print by eye. By combining Extensible Markup Language (XML) guidelines from the Text Encoding Initiative (TEI) and uncontracted Braille, we can now produce accessible scholarly editions that not only transmit the text reliably, but also allow the reader to experience the “visual” and material form of that text. “[a] consortium which collectively develops and maintains a standard for the representation of texts in digital form. Its chief deliverable is a set of Guidelines which specify encoding methods for machine-readable texts, chiefly in the humanities, social sciences and linguistics.” (Text Encoding Initiative n. pag.). The acronym TEI stands for the organization as well as the XML encoding guidelines (Text Encoding Initiative n. pag.). TEI is a discipline-specific markup language that interacts with the more general Extensible Markup Language (XML) to encode not only text, but very specifically how that text appears on the page or screen (Text Encoding Initiative n. pag.). As a simple example, the tags most relevant to the present scholarly edition prototype are the line markers, encoded <l>line of text</l> in TEI, which indicates line breaks. As established earlier, Braille, even uncontracted Braille, on its own does not adequately preserve and transmit textual materiality to the level of detail necessary to meet MLA standards of scholarship. For example, in the case of the “General Prologue,” line breaks are not diplomatically preserved even in the contracted Braille witness because the larger size of the Braille type does not allow the lines to fit exactly as they do on the printed page. However, if we incorporate the TEI code for a line break into the uncontracted Braille file, the reader can then literally feel where the line actually breaks in the printed text! This allows the scholar an accurate perception of line and meter, and, if the line number is also encoded, the scholar can then cite the line appropriately in apparatus or criticism. Consider the following example of Line 20 of Chaucer’s “General Prologue,” first in print, then in TEI-encoded print, and then in simulated TEI-encoded Braille. In the third part of the above example, the Braille reader can discern that this is Line 20, where it starts and stops, that “Southwerk” and “Tabard” are place names (likely glossed in the annotations), and that the period spelling of “Southwerk” in retained and not modernized to “Southwark.” And it gets better! TEI includes thousands of codes covering almost every imaginable textual detail including color, whether a piece of text is actually a note in the margin (marginalia), whether it was inserted by someone else, typed or by hand, in ink or in pen—sometimes, even types of pens can be identified and encoded. If detailed descriptions of images are available, they too can be included with TEI. This TEI/Braille hybrid code can now be output to a Braille computer printer/embosser or to a Refreshable Braille Display that supports uncontracted Braille. Therefore, any scholarly literary text that has been encoded with TEI stands at the ready for Braille conversion; all we have to do is make the code files available. In the case of Chaucer, several parts of The Canterbury Tales have been coded in TEI and digitized as digital humanities critical editions, such as “The Wife of Bath’s Prologue” (Robinson, Peter 74-92). Placing the line break codes at the ends of lines gives Braille readers a better spatial orientation of where the lines break and how long they are. Obtaining and configuring the right equipment to produce TEI-encoded uncontracted Braille remains as a challenge for future work. While some RBDs can be set to display uncontracted Braille, an argument for embossed (computer printed) Braille on paper is that it preserves yet another material aspect of interacting with text. TEI-encoded uncontracted Braille will provide unprecedented access to textual scholarship. However, there is a bit of a learning curve; users must know at least enough TEI to recognize the descriptors within the documents, and they must know uncontracted Braille. Most textual scholars, however, will know fundamental TEI, so learning the 35 or so symbols of uncontracted Braille should be only little more code to them. From the other end of the access continuum, students with very low or no vision who want to study textual scholarship will likely already know the Braille alphabet, as it is taught in blindness skills training. These users will need to learn some TEI, and perhaps a few markup symbols such as superscript, subscript, and, of course, the angle bracket. Finally, senior scholars may want to pick up the Braille skills to help preserve their vision, or to continue working when it inevitably starts to fail. Thus, the field of textual studies no longer needs to endure the loss of an eminent scholar due to failing eyesight. “Accessibility” and “scholarship” are two words that definitely belong in the same sentence in the context of literary and textual studies. With advanced technologies and novel techniques, such as TEI-encoded uncontracted Braille, no scholar who has a print disability but enjoys literature should ever again have to settle for a substandard text in an unsuitable format. The task remains ahead to identify the best hardware and software for producing accessible TEI-encoded uncontracted Braille documents. Efforts to encode scholarship reliably into TEI must remain ongoing so that quality encoded files are available. Nonetheless, this is doable, and doing it will allow the often “neglected” field of textual studies to gain significant interdisciplinary currency and validation by providing such ready solutions for the accessibility of text across the curriculum (Reiman xiv). Finally, textual scholarship has the potential to become a discipline committed to universal design by incorporating technologies and techniques such as those described in this essay. Such efforts could help expand a niche field that will only become more relevant, as Jerome McGann put it in a recent interview, as we reinvent our cultural heritage for the digital age. Thanks go first and foremost to Dr. Ann R. Hawkins of Texas Tech University, for her professional guidance through the development of this project, and for holding me firmly to the level of scholarly detail the discipline of textual studies requires. Thanks as well to Andrew Lucchesi for spearheading this special issue, and for his tireless work alongside Laura Kane to make it accessible through both displayed text and image descriptions. I also thank Dr. Sushil Oswal for his thoughtful and detailed review and feedback. This work was partially funded through a tuition waiver granted under Section 91.051(5) of the Texas Human Resources Code, and supported by grants of equipment and technology from the Texas Department of Assistive and Rehabilitative Services, Division for Blind Services. Finally, my sincere gratitude goes to the archivist at National Library Service, Section for the Blind and Physically Handicapped (SBPH) at the Library of Congress who located the Braille witness. American Foundation for the Blind. “Refreshable Braille Display.” Web. n.p. 6 April 2014. American Printing House for the Blind. Braille Series 1992 (In Three Books): Book Two: Beginning Contracted Braille. Louisville: American Printing House for the Blind, 1992. Braille. Benson, Larry D., Ed. The Works of Geoffrey Chaucer. By Geoffrey Chaucer. New York: Houghton-Mifflin, 1987. Print. Braille Bibles International. “New King James Bible.” Web. n.p. 28 Mar. 2014. Crow, Martin M., and Virginia E. Leland. “Chaucer’s Life.” In The Works of Geoffrey Chaucer. By Geoffrey Chaucer. Ed. Larry D. Benson. New York: Houghton-Mifflin, 1987. Print. Chaucer, Geoffrey. “General Prologue to The Canterbury Tales.” The Works of Geoffrey Chaucer. Ed. F. N. Robinson. 1957. Washington, DC: National Library Service, Section for the Blind and Physically Handicapped (NLS-SBPH), BRF01733, n.d. Hand-copied contracted Braille. Cited as Br. —. “General Prologue to The Canterbury Tales.” The Works of Geoffrey Chaucer. Ed. Larry D. Benson. New York: Houghton-Mifflin, 1987. Print. Cited as Be. —. “General Prologue to The Canterbury Tales.” The Works of Geoffrey Chaucer. Ed. F. N. Robinson. 2nd ed. Boston: Houghton-Mifflin, 1957. Print. Cited as Rb. —. The General Prologue to The Canterbury Tales. Ed. James Winny. Cambridge: Cambridge UP, 1965. Print. Cited as Wn. Doyle, A. I. and M. B. Parkes. “Paleographical Introduction.” In A Variorum Edition of the Works of Geoffrey Chaucer. Vol. 1. Ed. Paul Ruggiers. Norman: U of Oklahoma P, 1979. xix-xlix. Print. Duxbury Systems, Inc. Braille Transcription Tables. PDF. Greg, W. W. “The Rationale of Copy-Text.” Studies in Bibliography 3 (1950-51): 19-37. PDF. Hamraie, Aimi. “Collective Access: A Feminist Disability Theory of Universal Design.” Disability Studies Quarterly 33.4, 2013. Web. Date you accessed the material. Manly, John M. and Edith Rickert. The Text of The Canterbury Tales: Studied on the Basis of All Known Manuscripts. 9 vols. Chicago: U of Chicago P, 1940. Print. McGann, Jerome. Interview by Thomas Hill. The Library Café. 8 Apr. 2015. Web. 8 May 2015. Modern Language Association. Guidelines for Information Technology Access and Support for the Modern Languages. “Responsibilities of Departments and Institutions.” MLA, 2013. Web. 25 Apr. 2015. Modern Language Association Committee on Scholarly Editions. Guidelines for Editors of Scholarly Editions. 29 Jun. 2011. Web. 25 Apr. 2015. Oswal, Sushil. “Multimodality in Motion.” Disability and Kairotic Spaces. Web. 31 Aug. 2015. Reiman, Donald H. Foreword. Textual Editing and Criticism: An Introduction. Ed. Erick Kelemen. New York: Norton, 2009. Print. Robinson, F. N. “The Text.” The Works of Geoffrey Chaucer. By Geoffrey Chaucer. Ed. F. N. Robinson. 2nd ed. Boston: Houghton-Mifflin, 1957. Print. Robinson, Peter. ”The Canterbury Tales” and Other Medieval Texts.” Electronic Textual Editing. Eds. John Unsworth, Lou Burnard, and Katherine O’Brien O’Keefe. New York: Modern Language Association of America, 2006. 74-92. Bookshare Accessible Reader. Taylor, Joseph. “Chaucer’s Uncanny Regionalism: Rereading the North in ‘The Reeve’s Tale.’” The Journal of English and Germanic Philology 109.4, 2010: 468-489. PDF. Text Encoding Initiative. P5: Guidelines for Electronic Text Encoding and Interchange. 6 Apr. 2015. Web. 26 Apr. 2015. United States. Americans with Disabilities Act of 1990. Pub. L. 101-336. 26 July 1990. 104 Stat. 328. Web. Date you accessed the material. —. Library of Congress. National Library Service. Section for the Blind and Physically Handicapped (NLS-SPBH). NLS Voyager Catalog Entry for BRF01733. The Works of Geoffrey Chaucer: General Prologue Washington, DC: GPO. 3 Mar. 2015 . Web. Date you accessed the material. Williams, George H. “Disability, Universal Design, and the Digital Humanities.” Debates in Digital Humanities. 2012. Web. 25 Apr. 2015. This article’s documentation style adheres to the Modern Language Association (MLA) guidelines to accommodate specialized textual studies notation. Gia Alexander is a graduate student in Book History and Digital Humanities at Texas Tech University. She currently works as a technical writer, editor and teacher in the Harold Vance Department of Petroleum Engineering at Texas A&M University. She earned a Master of Arts in English from Texas A&M University, and a Bachelor of Arts in English from Northwestern State University of Louisiana. Her research interests include book history, textual studies, digital humanities, technical communication and journal writing. Next: Disability, Mental Illness, and eLearning: Invisible Behind the Screen? In UEB, the space between the more common prepositions (i.e. tothe) is no longer omitted. That was an EBAE rule only and has not been used since the adoption of UEB code. That is one less concern regarding contracted braille, anyway.